Season the chicken with salt, pepper and juice from half the lemon. Heat a comal or grill pan and cook the chicken for 5-8 minutes on each side until fully cooked. Prepare the dressing in a bowl, mixing the mayonnaise, chipotle in adobo and juice from the remaining 1/2 of the lemon. Taste for seasoning and add salt and pepper, to taste. Add 2 tablespoons of chopped coriander. Stir. On a large plate, layer the ingredients, starting with a bottom layer of lettuce, followed by tomato, avocado, chips, remaining coriander, green onions and shredded cheese. Once the chicken is fully cooked, let rest for 5 minutes and slice. 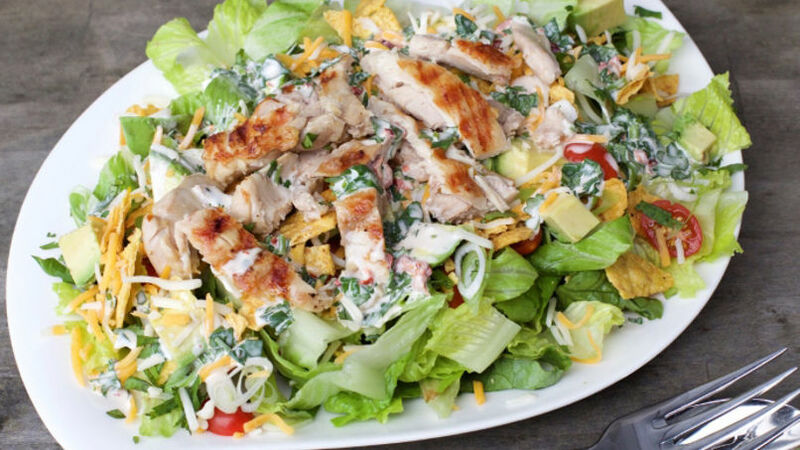 Arrange the chicken over the top of the salad and drizzle with dressing. To save time, use the pieces of broken tortilla chips at the bottom of the bag. For a heartier meal, add corn and beans. Luckily, there are some salads that have become family favorites. At home, this recipe is one of them. Some time ago I decided to give chicken thighs a try instead of using chicken breasts, since they’re a more budget-friendly and flavorful option. Try this Tex-Mex version that you will love!